I will be out of town from July 7 to 14, so if you contact me or place an order during that time, I won't be able to respond to you until the 15th or 16th of July...... but I will be happy to do so then! or jewelry based on the bead count used in traditional prayer beads. Necklace of freshwater pearls & crystal beads with glass seed beads. 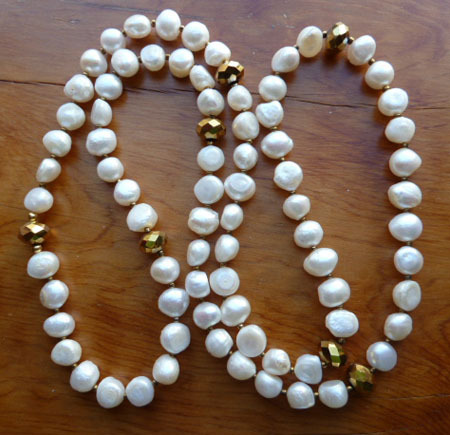 The pearls are in groups of 11 beads each, like the Sufi prayer beads called Tasbihs. So this can be use as prayer beads if desired. Approximately 33 inches. $36 plus $5 shipping. 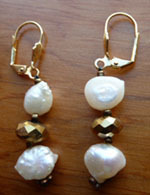 Earrings - Freshwater pearls & crystal beads with glass seed beads. Earwires are gold plate over brass. Beaded part of earring is 1 inch long. $8 plus $5 shipping. 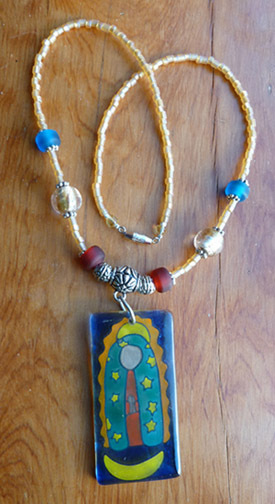 Necklace with painted glass Mary pendant. Glass and pewter beads and stainless steel clasp. Approximately 18 & 1/2 inches. $24 plus $5 shipping.